Check out this blog posting by Alex Ross (a music critic for The New Yorker) which features clarinetist Kari Kriikku's playing on two sample tracks filled with a cacophony of city-like noises from the 1985 composition Kraft by Magnus Lindberg. Kriikku is a native of Finland and has studied with Alan Hacker, Leon Russianoff, and Charles Neidich. A supporter of contemporary music, Kriikku is a member of the Avanti! 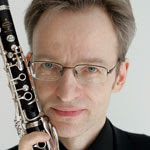 Chamber Orchestra and the Toimii ensemble (founded by Lindberg in 1980). If you are interested in hearing more of his playing, take a look at this YouTube video of his performance of klezmer, Arabic, and Portugese medleys with the Tapiola Sinfonietta.